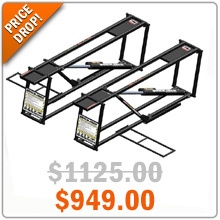 The previous-generation 3,500 and 5,000lb capacity QuickJacks are now available at the discounted price of just $949 (from $1,125), $1,049 (from $1,295) and $1,099 (from $1,340)! Add to that the FREE ground shipping in the continental U.S., which saves you up to over $250! The QuickJack is the easiest and most convenient product to use when raising your car off the ground, and they’re even portable, so take advantage of these savings today! Note: please confirm fitment for your vehicle before you purchase.